U.S. In Direct Contact With North Korea: 'We Do Talk To Them,' Tillerson Says : The Two-Way "We have lines of communications to Pyongyang," Secretary of State Rex Tillerson said. The State Department later said North Korean officials are not "ready for talks regarding denuclearization." Secretary of State Rex Tillerson shakes hands with China's President Xi Jinping in Beijing on Saturday. Tillerson acknowledged the U.S. has direct contact with North Korea over its nuclear program. China is seen as crucial in helping to avert a military confrontation. As the United States grapples with how to contend with North Korea's nuclear weapons program that has been fueling a worsening war of words, the rhetoric took a decisively cooler tone Saturday when Secretary of State Rex Tillerson acknowledged for the first time that the administration is in direct contact with Pyongyang over its missile and nuclear tests, reports The New York Times. "We have a couple, three channels open to Pyongyang. 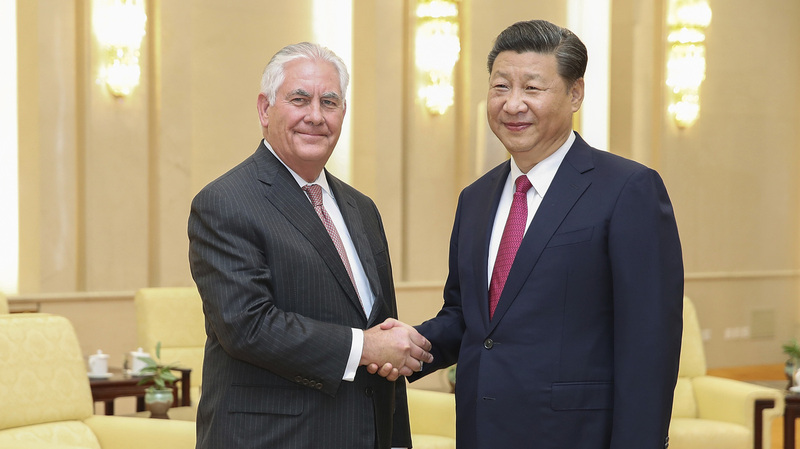 We can talk to them, we do talk to them," Tillerson told reporters Saturday in Beijing, according to the pool report. Tillerson made clear that those talks are not necessarily happening at Pyonyang's highest levels. When asked how he would open a dialogue with North Korean leader Kim Jong Un, Tillerson said, "We are probing. So stay tuned." Later Saturday, State Department spokeswoman Heather Nauert weighed in, affirming in a statement, "U.S. diplomats have several open channels in which we can communicate with officials within the North Korean regime." She went on to say, "Despite assurances that the United States is not interested in promoting the collapse of the current regime, pursuing regime change, accelerating reunification of the peninsula or mobilizing forces north of the DMZ, North Korean officials have shown no indication that they are interested in or are ready for talks regarding denuclearization." The secretary of state was in Beijing to meet with Chinese President Xi Jinping and other leaders to discuss denuclearization on the Korean Peninsula as well as trade and investment. Tillerson emphasized that the talks with Pyongyang are not being mediated by China. "Directly. Our own channels," he said. He did not say whether North Korea is responding to the overtures. "The whole situation is a bit overheated right now," Tillerson said. "I think everyone would like for it to calm down. I think if North Korea would stop firing all the missiles, that would calm down things a lot." Late last week, North Korea suggested it could test a hydrogen bomb in the Pacific. As The Two-Way reported, such a test would combine a nuclear weapon with a ballistic missile in an incredibly dangerous union. The threat followed President Trump's debut address at the United Nations General Assembly earlier this month, when he said, "if (the U.S.) is forced to defend itself or its allies, we will have no choice but to totally destroy North Korea." North Korea has already conducted six tests with nuclear weapons and separately an intercontinental ballistic missile test that it said could reach the United States. The Trump administration has said that if Pyongyang continues to scale up its weapons program, "all options are on the table," although by many accounts an all-out war would be catastrophic. The Times reports that the Trump administration is now trying out a tactic that the Obama administration used with Iran, which resulted in a nuclear accord: secret back-channel negotiations. Granted it took years of diplomacy to reach a deal. But Tillerson emphasized Saturday that the situations are different. Tehran had a program that may have led to nuclear weapons. Pyongyang already has them. "We are not going to put together a nuclear deal in North Korea that is as flimsy as the one in Iran," Tillerson said. His visit to Beijing comes at a time when the ties between the U.S. and China are considered more important than ever, reports The Associated Press. China is seen as a crucial partner to averting war with North Korea and Trump has been pressing Beijing to take stronger economic measures against Pyongyang. In a move in that direction, on Thursday China ordered North Korean-owned businesses on its soil to close in accordance with U.N. sanctions. On Friday, the White House announced that Trump will travel to five Asian nations, three of which play central roles in the crisis with North Korea: Japan, South Korea and China. "The President's engagements will strengthen the international resolve to confront the North Korean threat and ensure the complete, verifiable, and irreversible denuclearization of the Korean Peninsula," the White House said in a statement.